From the Star Wars collection by Plasticolor. Star Wars Hoth Scene Accordion Sunshade. From the Star Wars collection by Plasticolor. 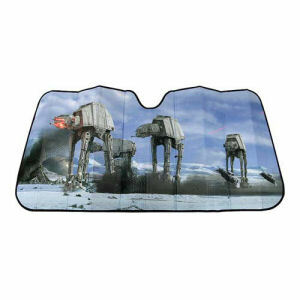 Star Wars Hoth Scene Accordion Sunshade. Auto shade measures 58 inches wide by 27.5inches tall. This accordion sunshade fits most cars and trucks. It protects and cools.Blocks out UV rays that fade your dash. Plasticolor Star Wars Automotive shipping from Canada. No Surprise Border fees or Customs!